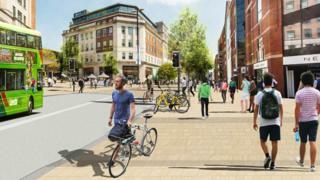 A £20m plan to transform large parts of Leeds city centre has been approved by councillors. Changes to The Headrow and surrounding streets will include new cycle lanes and extra pedestrian crossings. Vicar Lane will also be changed to two-way traffic for buses and some general traffic. Councillor Judith Blake, leader of Leeds City Council, said the work would help people "move about the city by foot or by bike". The changes will also "allow buses to move far more efficiently", with some bus stops moved and lanes enforced by cameras, according to a council report. The work is to feature new trees and wider footpaths to improve the city and enhance the Town Hall and Victoria Gardens. Ms Blake said: "This multi-million pound investment will see huge improvements for public transport reliability, reducing delays and giving buses priority to get easily through the city centre." The £20.7m scheme includes changes to The Headrow, Westgate, Vicar Lane, New Briggate, Infirmary Street, Park Row, Cookridge Street and streets linking these together. The scheme, known as the Headrow Gateway, was approved by the council's executive board and is expected to be completed by 2020-2021. The work is part of Connecting Leeds, which aims to spend £270m on the city's transport network.